I would have thought that the dinosaur would have been owned by the state unless you had a permit to dig it up, though. 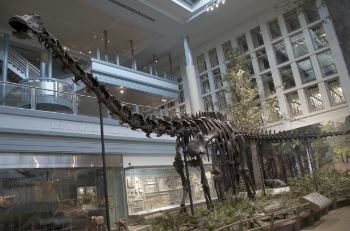 As much as I would love to have a giant dinosaur skeleton in my living room, I can't see myself shelling out 1 million. I agree that it should stay in a museum. Paleontologists(like the guy whos kids found this) are generally very good about getting permits before they go out. And yes, it really does belong in a museum. Paleontologists(like the guy whos kids found this) are generally very good about getting permits before they go out. A permit to carefully dig the thing out I could understand...to keep the thing afterwards, instead of it going to the state, or to a museum the state favoured, not so much. It depends on where the dinosaur is found. If it is dug up on private land, it is private property, and can be sold like anything else. No different than finding a gold mine or oil deposit in your back yard. Another article lists the quarry as privately owned - does this help clear up discussions of who owns the dinosaur? I personally agree with many people here, it belongs in a museum! I'm not so sure this does belong in a museum. There are so many thousands of things languishing about in museum basements, and although this would almost undoubtedly be displayed, this would be at the cost of a whole host of things that people had no idea even existed. I'd rather this went to a private collector, who would actually enjoy it, than have it being ignored as a centrepiece in a museum. I mean, how many dinosaur skeletons are currently under lock and key? It's not like this one being sold will affect the rest. I wonder how the purchaser will maintain it... does it come with an instruction manual? Maybe an IKEA guide to putting it together? Special dinosaur bone polish? The logistics of keeping a skeleton are fascinating. I would think if you were rich you could probably have a replica dinosaur skeleton created for cheaper which would look just as good and wouldn't require constant maintenance like a real skeleton. Something to consider for those of you who plan on winning the lottery.